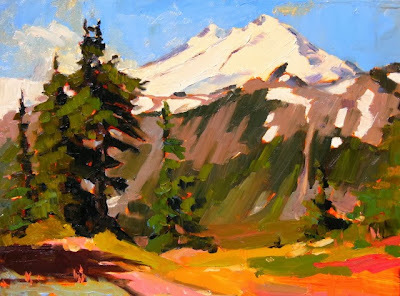 This painting begins another adventure to one of the most scenic spots in Washington State. 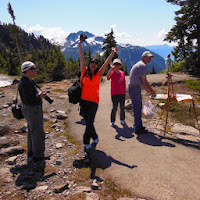 So much visited by photographers and artists that they named the area Artists Point! Drive Highway 542 east from Bellingham 55 miles to its end at the upper Mount Baker Ski Area parking lot. I went up this trip with my painting buddy Mark Bistranin from the Seaside Gallery in LaConner. The weather was perfect so we got right to work. 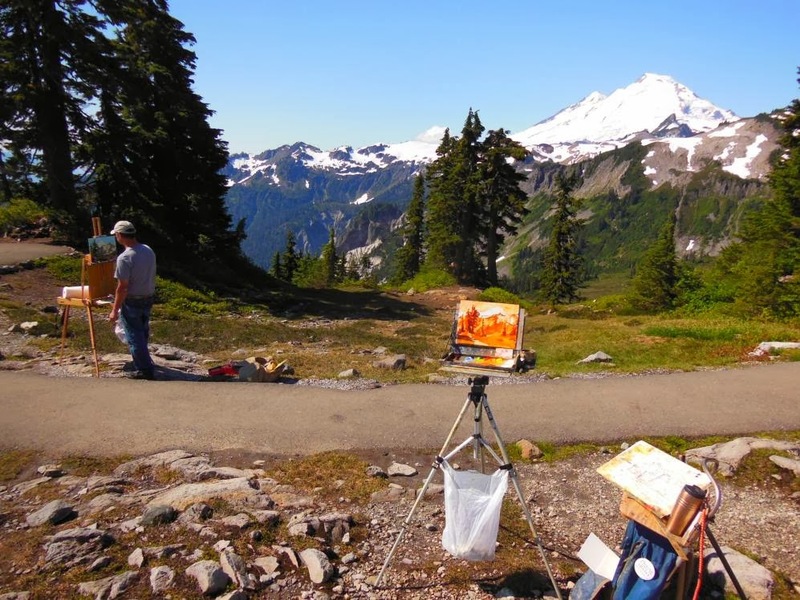 You can see my set up and underpainting for Mt Baker , while Mark tries for a view of Mt Shuksan. We love the Japanese tourists! They always seem to be excited to see us artists out painting! Our last day on the Island was the Moran State Park benefit art show and gala at Crow Valley Pottery. The parking lot across Orca Rd. was filling fast as we pulled in and folks were enjoying the beautiful weather and the amazing art work created just for this exhibition. Some of us PAWA artists set up to do some demo paintings while the patrons strolled the property. I set up in the shade by the fence next to Jeffris field. I cut out early and high-tailed it for the ferry. I was ready to head home after a week of camping and painting. 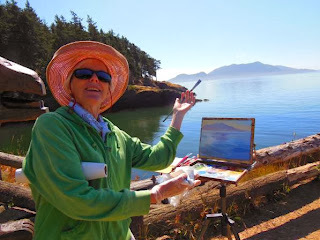 This concludes the great Orcas Island paint out! We all had a blast! Now it is off to other adventures! 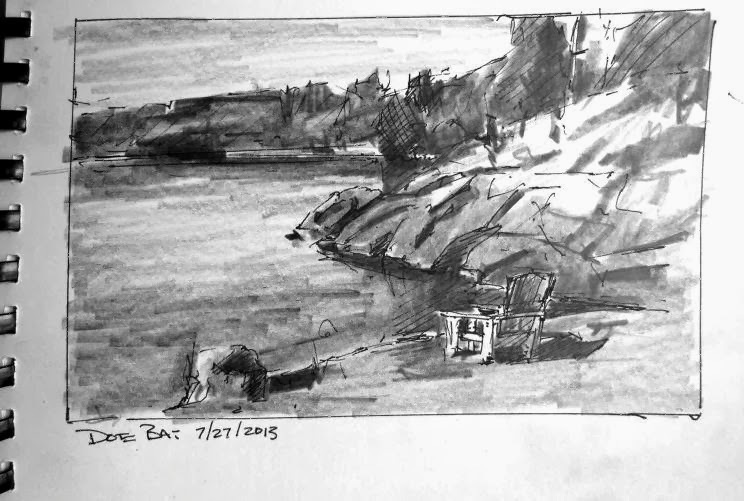 The last night on Orcas, Paula Ensign graciously let me park at her camp spot at Doe Bay. I had no reservations for that night and wasn't sure where I would be able to van camp. 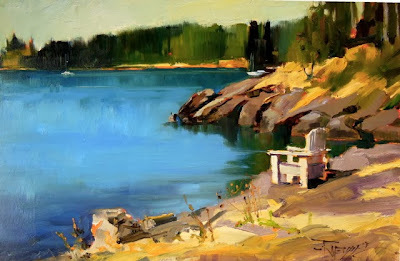 In the morning we all met out at the waters edge to paint the bay. This is the scene that greeted us! Panoramic view of Doe Bay at Orcas Island, Washington State. You can see the white chair we painted in the right bottom corner. Annie Leedy paints a luminous Doe Bay! 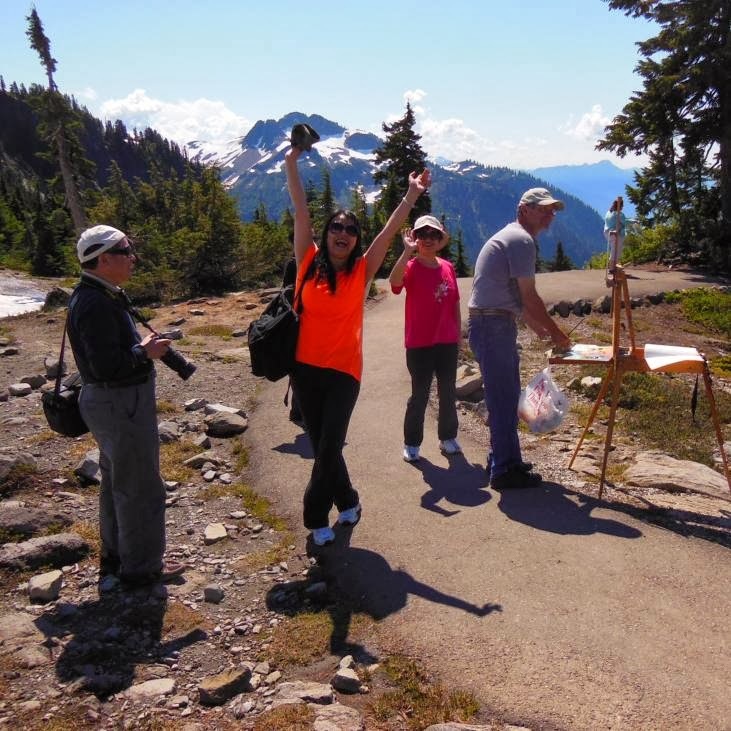 It was a glorious day and we all had a great time painting , laughing and hamming it up for the camera! Another great state park on Orcas Island is Obstruction Pass State Park. You don't get the feeling there is much to it after the long gravel road to the unassuming parking lot. The trail in doesn't offer much either. It's not until you get to the end of the trail and see the spectacular views of the straits that the wow factor hits! I love a lead in to my compositions and always try and look for what is available, whether it is a stream, road, trail or line of driftwood. Look for something that will take the eye deeper into the scene.. While scouting Moran State Park we ran across a great place to paint during the heat of the day. This little amphitheater of falling water is along the Cascade Falls trail. 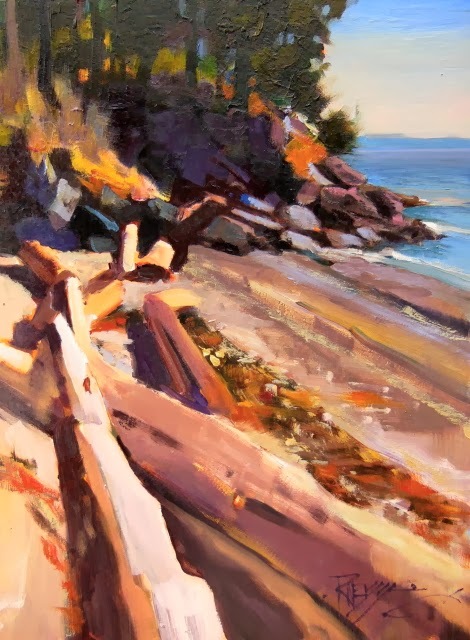 The protected spot was quite cool and offered the perfect focal point for a plein air study. 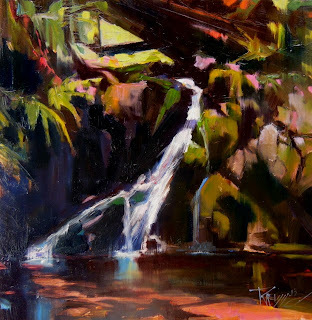 Janis Kirsten did a great little painting of Rustic Falls as we all gathered to beat the heat and keep painting! 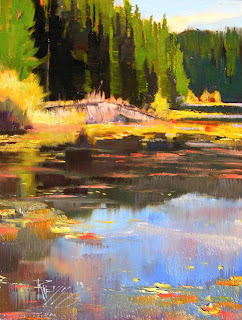 Summit Lake is a small, quiet lake full of lily pads and beautiful reflected light and color from the fir trees that surround it. Most people pass right by it on their way to the top of Mt. Constitution. FYI, once again, I will be trying to catch up with my posting since I have been on several painting trips since Orcas Island.....which was back in July! This is a good example of how a plein air painting can be enhanced after touching it up in the studio. I realized when I got back home after studying the photos, the forest could be perceived as older and deeper if the foreground tree shape was made larger. 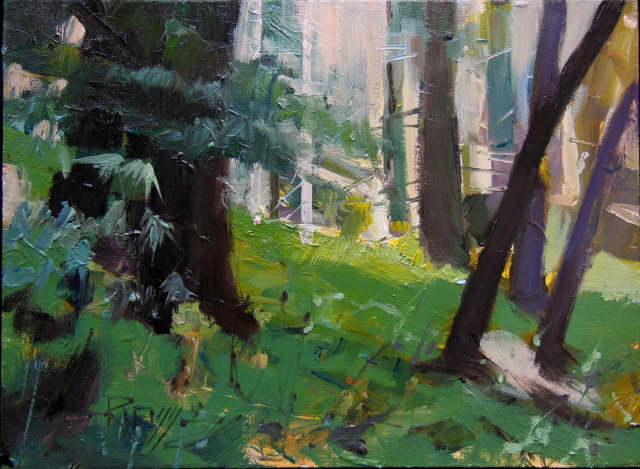 It also gave a dark value background for suggesting some detail of the smaller trees growing up. Here you see the painting as I completed it on location. I had mounted it on a floater frame and then covered it in brown paper so the wet painting could be hung for the show at the end of the event. It worked very well and no paint got on the frame!